Amazon have a little-reported, but undeniable record of preventing their work force from unionising. In 2001, Amazon.co.uk hired a US management consultancy organisation, The Burke Group, to assist in defeating a campaign by the Graphical, Paper and Media Union (GPMU, now part of Unite the Union) to achieve recognition in the Milton Keynes distribution depot. It was alleged that the company sacked four union members during the 2001 recognition drive and held a series of captive meetings with employees. Also In 2001, 850 employees in Seattle were laid off by Amazon.com after a unionisation drive. The Washington Alliance of Technological Workers (WashTech) accused the company of violating union laws, and claimed Amazon managers subjected them to intimidation and heavy propaganda. According to Unite the Union, Amazon continues to this day to see trade union representation as illegitimate. -Given only one break of 15 minutes and another of 20 minutes per eight-hour shift and told they had to notify staff when going to the toilet. Amazon said workers wanted the shorter breaks in exchange for shorter shifts. Meanwhile in Germany,Amazon was recently accused of using neo-Nazi guards to intimidate the workforce in its warehouse in Germany. The prices on Amazon’s website may seem amazingly cheap, but these savings come primarily from publishers, who are squeezed for every penny, as Amazon forces them to supply them at rates so low that it leaves authors and publishers out of pocket – particularly damaging smaller publishing houses. Amazon’s dominance of the market means that publishers have little choice but to comply with their demands. Aside from the ethical considerations, this affects readers in reduced output from small presses, and diminished availability of radical titles. Housmans has spoken to several publishers who have felt forced into offering huge discounts to Amazon, but who do not wish to go on record with their grievances. The less money publishing houses make, the less there is for writers, and it creates an even tougher environment to publish in. This battle is now extending to ebooks, where Amazon are again fighting hard to maximise profits at the expense of publishers. Housmans cannot compete with Amazon on price, and nor would we want to. Amazon achieves its low prices by paying its workers the bare minimum and making it impossible for workers to unionise in order to struggle for better conditions. It also achieves its low prices by using its position of market dominance to squeeze small publishers, forcing them to offer their books to them for as little as possible, with the threat that if they don’t Amazon won’t stock them. The savings made by a customer using Amazon comes from the pockets of publishers, authors and Amazon staff. Amazon are a company on a mission: to completely dominate the online shopping marketplace. Not content with selling books, DVDs, music, DIY tools, electronic equipment and clothes, Amazon have also recently started selling groceries in bulk. But that’s not all – Amazon has also taken on online payment companies such as PayPal with its ‘Amazon Payments’ service, further extending its attempt to control all aspects of online retail. Monopolies are always a dangerous thing – the more power they have, the more they will use it get their own way at the expense of workers rights. “What singles Amazon out as a consumer-facing tax avoider is not just its size and market power, but the fact that its whole business model appears to be built around tax avoidance as a way of competing on price. The Guardian ran a series of articles on Amazon’s approach to tax in April this year. Evidence showed that the company which sold one in four books in the UK, and generated £7.5bn from sales here in the last three years, did so without attracting any corporation tax on the profits from those sales. This position was engineered by the transfer in 2006 of ownership of the main UK business to the Luxembourg-based company Amazon EU Sarl. Luxembourg is number three on the Tax Justice Network’s list of damaging secrecy jurisdictions.4 The Guardian estimated that the company may have avoided paying a tax bill of around £100 million in the last three years. The problem with Amazon’s approach is just as pronounced elsewhere. On May 25th this year, one hundred protesters gathered outside Amazon’s shareholder’s meeting in Seattle calling on Amazon to pay more taxes and treat its workers better. The world’s largest internet retailer collects sales taxes from only five out of fifty US states, exploiting a court ruling requiring a physical presence in a state for sales to be taxable. 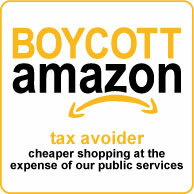 In 2008, Business Week found that Amazon paid a lower percentage of its profits in tax (around 4%) than 488 of the 500 biggest companies in the USA.